LOCATION.--Lat 43°30'42", long 75°18'24" referenced to North American Datum of 1983, Oneida County, NY, Hydrologic Unit 04150101, on left bank at downstream side of bridge on Moose River Road, 0.8 mi upstream from Sugar River, and 2 mi northeast of Boonville. PERIOD OF RECORD.--January to February 1911 (monthly discharges only, published in WSP 1307), March 1911 to current year. REVISIONS HISTORY.--WSP 784: 1934. WSP 1084: 1912(M), 1913, 1917-1919(M), 1922(M), 1924(M), 1926(M), 1928(M), 1930(M), 1933(M). WSP 1307: 1914(M). WDR NY-82-1: Drainage area. WDR NY-05-1: 2004. GAGE.--Water-stage recorder and crest-stage gage. 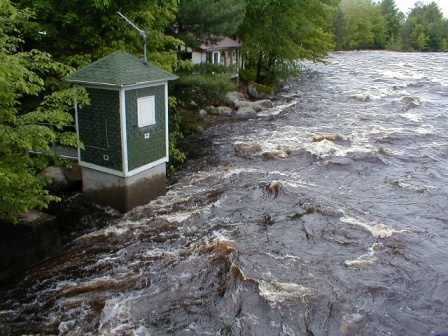 Datum of gage is 935.50 ft above NGVD of 1929 and 935.18 ft above NAVD of 1988 (VERTCON). Prior to Sept. 27, 1933, nonrecording gage at same site and datum. REMARKS.--Occasional regulation by several headwater reservoirs. Forestport feeder diverts water from State Pond at Forestport 9 mi upstream. That portion of diverted water which does not pass Black River Canal (flowing south), returns to Black River downstream from station through Mill Creek sluiceway. Slight diurnal fluctuation at medium and low flow caused by powerplant upstream from station. EXTREMES FOR PERIOD OF RECORD.--Maximum discharge, 12,800 ft³/s, Apr. 18, 1982, Dec. 30, 1984, gage heights, 11.31 ft and 11.41 ft, respectively; maximum gage height, 13.10 ft, Feb. 21, 1981 (ice jam); minimum observed discharge, about 5 ft³/s, Aug. 26, 1918, gage height, 2.40 ft.